After a string of sell-out tours, countless TV appearances, three hit DVDs and an acclaimed autobiography, Jason Manford is rightly regarded as one of the UK’s most successful comedians. His big break came in 2007, when Manford began a five year-stretch as a starring team leader on comedy panel show 8 Out of 10 Cats, soon establishing this charming northern funnyman as a national figure of fame. But Jason’s journey begins some eight years earlier, in 1999, when a plucky 17-year-old lad bagged a low-skilled job collecting glasses, at a comedy club above a hotel in Manford’s hometown of Manchester. When a headliner failed to show up, the sprightly teenager offered to step in. Six gigs later, Jason Manford was crowned The City Life North West Comedian of the Year – setting this straight-talking stand-up on the road to becoming one of the UK’s most famous comedians. Manford’s 2005 Edinburgh Fringe show Urban Legends was nominated for the career-defining Perrier Award, and the gigs just kept getting bigger. And then naturally, telly beckoned. After proving his wit and charisma on 8 Out of 10 Cats, Manford was invited to present his own new shows Comedy Rocks and Tonightly. In 2010 Manford was appointed as presenter for the BBC’s primetime The One Show, as well as starring in game show the Odd One In – one-half of a team alongside Peter Andre. He also presented reality comedy contest Show Me the Funny, and wrote and presented ITV’s NYE special A Funny Old Year, from 2012-14, offering a light-hearted look back at the past 12 months. A huge football fan – and loud Manchester City supporter – in 2014 Manford became host of football quiz show A Question of Sport: Super Saturday. 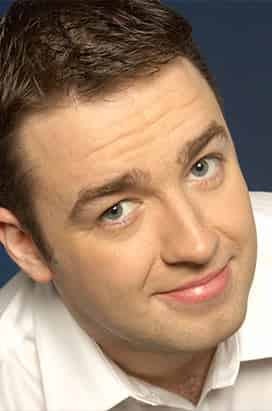 Earlier this year he launched his own weekly Jason Manford Show on Absolute Radio, tackling current affairs on the airwaves. Throughout the years, Manford has proved a mighty off-screen live draw, relentlessly touring his accessible stand-up routines across the lands. His priceless material has been bottled in three live DVD releases: Live at the Manchester Apollo (2009), Live 2011 and First World Problems (2014). The ultimate sign of celebrity came in 2012, with the release of autobiography book, Brung Up Proper, detailing his humble beginnings and rise to fame. And Manford uses the power of fame for good. After years supporting charity causes, Jason was hailed as a people’s hero after becoming the unofficial spokesman for Stephen Sutton, a 19-year-old teenager diagnosed with terminal cancer, who sadly passed away in 2014. Manford tirelessly championed Sutton’s charity Stephen’s Story, appearing on TV interviews from BBC to Al Jazeera, plugging endlessly on social media and donating more than Dhs60,000 of his own cash. Siting Billy Connolly, Peter Kay and family entertainers such as Eric Morecambe and Tommy Cooper as key influences, Manford’s material is known for wit and insight, without resorting to cheap, crude jokes or low-hanging fruit. Jason Manford is without doubt one of the greatest comics working today – and it is with great pride we announce his return to The Laughter Factory.